Whether you need to keep scanning during a renovation, test your market for referral traffic, or simply catch some overflow that your current scanner can't handle, renting a mobile MRI could be exactly the solution you're looking for. And, since this solution has already occurred to you, your next course of action was a quick Google search to find out how much such a thing might cost. Good thinking, you! Keep reading to find the current average costs of renting a mobile MRI, as well as a few other things that you should keep in mind as you enter the process. Generally speaking, the longer your rental term, the lower the amount of each payment. Think of this along the same lines as buying bulk. If you buy the 12-pack of Bounty, each roll costs a whole lot less than if you bought each roll packaged separately, right? It's the same principal with months on a rental term. The level of technology you choose to rent will be the other deciding factor in the overall cost of your mobile rental. The pricing will vary from model to model. If you choose a newer, more feature-rich 3T magnet, you can expect to pay significantly more than you would for a standard 1.5T magnet. Rentals typically come with a delivery and pick-up charge to cover the costs of trucking. Your provider will try to find something as close to your location as possible, but costs may vary. Now we get to the part you came here for: the prices. 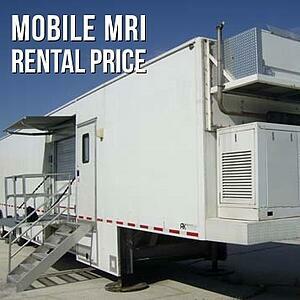 MRI rentals can typically be found anywhere from $18,000 to $45,000 per month. As we mentioned earlier, longer terms and older technology cost less, while shorter terms and newer technology cost more. A 3.0T scanner rented for 3 months, for example, will skew toward the higher end of the range. A 1.5T scanner for 9 months will fall to the lower end. If you're planning to hold onto a system longer than a year, we suggest you consider a lease with a buy-out. This option reduces your monthly payments even further and allows for ownership at the end of the lease. Rental not for you? Click here to see our inventory of MRI scanners for sale. This fee works just like the deposit on renting an apartment. If there are no damages at the end of your rental term, you get the money back. If there are damages, the cost to repair them will be deducted from the deposit. These charges cover the costs of moving the system to and from your location. If necessary, you can request expedited shipping at an additional charge. Planning and ordering ahead will help you avoid this. Typical transportation fees range between $3,000 and $5,000, though particularly long distances could exceed this range if there is no system availability relatively nearby. This is usually a small charge to cover the cost of cleaning the trailer and the scanner in preparation for the next renter. If you choose to rent a scanner that your staff is unfamiliar with, you can add applications training to your quote. Training can take anywhere from a couple of days to an entire week, depending on your technicians' level of experience. If you're prepared to start the conversation about renting a mobile MRI, we're here to help. We can fill you in on any other questions you might have as well as start building your individual quote- contact us! This is just one of the many MRI machine articles we have for you. 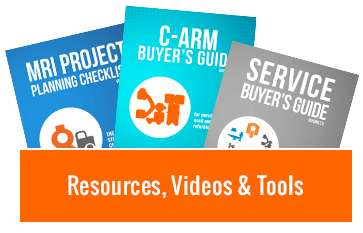 If you want to keep reading about systems, parts, service, and news, click here to see the complete list of content for this topic.